The Fas-associated death domain protein (FADD)/Mort1 is a signaling adaptor protein which mediates the activation of caspase 8 during death receptor-induced apoptosis. Disruption of FADD in germ cells results in death receptor-independent embryonic lethality in mice. Previous studies indicated that in addition to its function in apoptosis, FADD is also required in peripheral T cell homeostasis and TCR-induced proliferative responses. In this report, we generated B cell-specific FADD-deficient mice and showed that deletion of FADD at the pro-B cell stage had minor effects on B cell development in the bone marrow, and resulted in increased splenic and lymph node B cell numbers and decreased peritoneal B1 cell numbers. As in T cells, a FADD deficiency inhibited Fas-induced apoptosis in B cells. However, B cell-proliferative responses induced by stimulation of the BCR and CD40 using anti-IgM or anti-CD40 Abs were unaffected by the absence of FADD. Further analyses revealed that FADD-deficient B cells were defective in proliferative responses induced by treatments with dsRNA and LPS which stimulate TLR3 and TLR4, respectively. Therefore, in addition to its apoptotic function, FADD also plays a role in TLR3- and TLR4-induced proliferative responses in B cells. In mammals, T cells are generated in the thymus from bone marrow-derived progenitor cells, whereas conventional B cells develop in the bone marrow and mature in the periphery. During lymphocyte development, random DNA rearrangements required for Ag receptor gene expression give rise not only to Ag-specific lymphocytes but also to those recognizing self. To avoid autoimmune diseases, self-reactive lymphocytes must be eliminated through mechanisms such as apoptosis (1, 2, 3). In an immune response, signaling through Ag receptors induces lymphocyte proliferation and differentiation, and in the subsequent contraction phase, effector lymphocytes are removed by apoptosis to prepare the immune system for future responses to distinct Ags (2, 4). The Fas (or Apo-1) receptor can induce lymphocyte apoptosis, and mutations in the Fas gene cause an autoimmune-lymphoproliferative syndrome (ALPS)4 (5, 6, 7). Upon triggering of apoptosis by Fas ligand engagement, the intracellular death domain (DD) of Fas binds to the DD of Fas-associated DD protein (FADD) (8, 9, 10), and the death effector domain (DED) of FADD interacts with the DED present in procaspase 8 (FLICE or MACH) (11, 12). In addition to Fas, other death receptors such as TNFR1 and TRAILRs also require FADD as an adaptor for apoptotic signal transduction (13, 14, 15, 16). Regulation of death receptor-induced apoptotic signaling involves the cellular FLICE-like inhibitory protein (c-FLIP, Casper, I-FLICE, CASH, FLAME-1, MRIT, CLARP, or usurpin), which is homologous to caspase 8 but lacks a protease activity (17, 18, 19). Aside from ALPS, Fas mutant mice otherwise show normal embryonic and postnatal development. Mice lacking either TNF-R1 or TRAIL-R also develop normally and show no sign of ALPS (20, 21). Surprisingly, deletion of FADD, caspase 8, or c-FLIP results in early embryonic lethality in mice (22, 23, 24, 25). T cells lacking FADD or expressing a FADD dominant-negative mutant are defective in TCR-induced proliferation and Fas-induced apoptotic responses (22, 26, 27, 28, 29). T cell-specific deletion of caspase 8 or c-FLIP resulted in similar proliferation defects in peripheral T cells (30, 31, 32, 33). Importantly, mutations in the human caspase 8 gene caused both impaired apoptosis and immunodeficiency (34, 35). Therefore, it appears that FADD, caspase 8, and c-FLIP constitute a novel signaling complex with a dual function in both apoptosis and TCR-induced proliferation signaling. An absence of FADD or c-FLIP in embryonic stem (ES) cells in FADD−/−→RAG-1−/− chimeric mice severely impaired T cell development (22, 33), whereas the deletion of FADD, caspase 8, or c-FLIP after T lineage commitment had no obvious effect on intrathymic development (26, 30, 32). Neither FADD−/−→RAG-1−/− nor c-FLIP−/−→RAG-1−/− chimeras contain detectable B cells, indicating that FADD is essential for B cell lymphopoiesis (22, 33). However, the temporal requirement of FADD during B lineage development has not yet been determined. There are at least three subsets of mature B cells in mice (36, 37). The recirculating follicular B cells are usually found in lymphoid follicles of the spleen and lymph nodes. Marginal zone B cells are derived from transitional B cells (38), and reside primarily around the periphery of the splenic lymphoid nodules. The development of these conventional (or B2) B cells is initiated in the bone marrow and continues in peripheral lymphoid organs such as the spleen (39). Finally, B1 B cells are believed to be fetal liver-derived, long-lived and present mainly in the peritoneal and pleural cavities (40, 41). The BCR induces intracellular signaling processes analogous to those induced by the TCR. Given the proliferation defect present in FADD-deficient T cells, it was of interest to determine whether FADD is required for proliferative responses induced by BCR signaling. B cells can also be induced to proliferate by stimulation of CD40 and by certain macromolecules present in microbial pathogens which can trigger intracellular signaling through TLRs. These evolutionarily conserved “pattern recognition” receptors play a critical role in innate immune responses (42, 43). TLRs contain an intracellular TLR/IL-1R (TIR) domain which interacts with the TIR domain of the adaptor protein MyD88. The DD of MyD88 binds that of IRAK serine/threonine kinases (44, 45). Although MyD88 is believed to be used by all TLRs during signaling, other adaptor proteins, such as TRIF (TIR domain-containing adaptor protein-inducing IFN-β), mediate alternative pathways, particularly those induced by TLR3 and TLR4 (46). In this study, we generated B cell-specific FADD-deficient mice using the Cre-LoxP system to determine the temporal requirement of FADD in B cell lymphopoiesis and the FADD function in apoptosis and proliferation responses in B cells. Analysis of these mice revealed that FADD is required for Fas-induced apoptosis in B cells to maintain homeostasis in the spleen and lymph nodes. Furthermore, FADD plays a role in B cell proliferative responses induced by TLR3 and TLR4. FADD+/− and FADD:GFPflox mice were reported previously (22, 26) and crossed to obtain FADD+/− FADD:GFPflox mice, which were then backcrossed to FADD+/− mice to produce viable FADD−/−FADD:GFPflox mice. To generate B cell-specific FADD-deficient mice, CD19-Cre transgenic mice, provided by Dr. K. Rajewsky (Harvard Medical School, Boston, MA), were crossed with FADD+/− mice. The resulting FADD+/− CD19-Cre mice were backcrossed to B6 mice. Cosegregation of the FADD knockout allele and CD19-Cre allele in the offspring indicates that crossovers on the chromosome 7 resulted in linkage of these two gene alleles on the same chromatid in the parental mice. These were then crossed with FADD−/−FADD:GFPflox mice to generate B cell-specific FADD-deficient FADD−/−FADD:GFPflox CD19-Cre mice. Mouse genotypes with regard to FADD alleles were determined by Southern blot analyses using mouse tail DNA and a 0.4-kb probe to detect the endogenous and knockout FADD alleles and FADD:GFP as different sizes of EcoRI fragments as described elsewhere (26). The CD19-Cre gene was detected by PCR using oligo primer DNA sequences (GTCTGAAGCATTCCACCGGAA and CTGCGTGCAATCCATCTTGTT) and a protocol (1 min at 94°C, 1 min at 63°C, and 2.5 min at 72°C for 35 cycles) provided by Dr. R. Richert (Burnham Institute, San Diego, CA). All animal studies were approved by the Institutional Review Board at Thomas Jefferson University. Single-cell suspensions were prepared from the bone marrow, spleen, lymph nodes, or peripheral blood. RBC were depleted by hypotonic lysis. To determine GFP expression, cells were subjected to flow cytometric analysis using a Coulter Epics XL analyzer (Beckman Coulter). For cell surface protein staining, appropriate fluorochrome-conjugated Abs were added to single-cell suspensions in PBS with 1% FBS and 0.1% sodium azide, followed by incubation on ice for 20–30 min and two washes with PBS. Peritoneal cavity cells were harvested from individual mice by flushing two times with 5 ml each of RPMI 1640 medium (Mediatech). After counting, cells were resuspended in staining buffer (3% BSA, 0.5 mM EDTA, 0.02% sodium azide) and stained with appropriate Abs. The following Abs were used: Tri-Color-conjugated anti-CD4, CD8, B220, and biotinylated anti-CD23 Abs (Caltag Laboratories); PE-conjugated anti-AA4.1, and TLR-4 Abs (eBioscience); PE-conjugated anti-CD3, CD21, CD25, c-Kit, and biotinylated anti-CD19 (clone 1D3), CD5 (clone 53-7.3), CD11b (Mac-1, clone M1/70) Abs, streptavidin-CyChrome (BD Biosciences); PE-conjugated anti-mouse IgM Abs (clone II/41; Jackson ImmunoResearch Laboratories); biotinylated anti-IgD (clone 11-26; Southern Biotechnology Associates). Cells were analyzed using a Coulter Epics XL cytometer (Beckman Coulter), and data analyzed with WinMDI (C. J. Trotter, The Scripps Institute, La Jolla, CA) and FlowJo softwares (Tree Star). To purify B cells by sorting, single-cell suspensions were prepared as described above and stained with Tri-Color-anti-B220 or PE-anti-CD19 Abs. CD19+GFP− or B220+GFP− cells were isolated using a MoFlo high-speed cell sorter (DakoCytomation). Spleen and lymph nodes cryostat sections (5–6 μm) were prepared and immunohistology was performed as previously described (47). Abs were detected using the Vector Blue Alkaline-phosphatase Substrate kit III and the Vector NovaRed kit for peroxidase (Vector Laboratories). HRP-anti-CD4 (clone GK1.5) Abs were made in-house. The stained sections were analyzed using a light microscope (Leitz Diaplan, Axioplan Universal Microscope; Carl Zeiss MicroImaging), and digital images were captured using an Eastman Kodak camera. B cells were cultured at 37°C in a 5% CO2 incubator in RPMI 1640 (Mediatech) supplemented with 100 U/ml penicillin, 100 μg/ml streptomycin, 1 mM glutamine, 50 μM 2-ME (Sigma-Aldrich), and 10% FBS (HyClone Laboratories). Sorted mutant and control B cells were seeded to 96-well plates (105/well) in 100 μl of RPMI 1640 medium. Soluble FasL (sFasL; Alexis Biochemical) was added at various concentrations in triplicates. Anti-FLAG Abs M2 (Sigma-Aldrich) were then added (1 μg/ml) to the culture. After a 16-h incubation, cells were transferred to flow tubes and subject to analysis using a flow cytometer after addition of propidium iodide (PI) (1 μg/ml). Concentrations of serum Igs were determined by ELISA. Ninety-six-well flat-bottom plates (Thermo Labsystems) were coated with 10 μg/ml goat anti-mouse capture Ab (Southern Biotechnology Associates) in PBS overnight at 4°C. Plates were washed with 0.05% Tween 20 in PBS and blocked with 1% BSA in PBS for at least 1 h at room temperature. After washing, serum dilutions of 1/10,000, 1/30,000, 1/90,000, and 1/270,000 were made and added to appropriate wells for 1 h at room temperature. After washing, HRP-conjugated goat anti-mouse Igs were added for 1 h at room temperature, then thoroughly washed. Substrate solution was prepared by mixing 10 ml of citrate substrate buffer (525 mg of citric acid in 50 ml of H2O) with 0.2 ml of 2,2′-azino-bis(3-ethylbenzthiazoline-6-sulfonic acid) stock solution and 100 μl of 3% H2O2. Substrate solution was added to the wells and absorbance was measured at 405 nm at 10 and 20 min. Ig concentrations were determined by using a standard curve obtained from every ELISA plate. For [3H]thymidine incorporation assays, sorted B cells were plated in triplicates in 96-well round-bottom plates (105/well) in 100 μl of RPMI 1640–10% FBS, and cultured for 40 h in the presence of LPS, poly(I:C) (Sigma-Aldrich), CpG ODN 1826 (Coley Pharmaceutical), F(ab′)2 of goat-anti-mouse IgM (μ-chain; Jackson ImmunoResearch Laboratories), or anti-CD40 Abs (clone FGK45; Alexis Biochemical) at indicated concentrations. 0.5 μCi [3H]thymidine (ICN Biochemicals) was added into each well after 36 h, followed by an additional 8-h incubation. Incorporation of [3H]thymidine was determined using a Wallac beta counter (PerkinElmer). To analyze cell division by CFSE labeling, B220+GFP− B cells were sorted from the spleen and lymph nodes, labeled with 5 μM CFSE (Molecular Probes) in PBS plus 5% FBS for 5 min at 37°C in dark, and washed three times with 5 ml of RPMI 1640–10% FBS. These labeled cells were then stimulated with LPS (10 μg/ml) or anti-IgM Abs (10 μg/ml) for 72, 96, and 120 h, and analyzed using a flow cytometer. 7-Aminoactinomycin D (7-AAD; BD Pharmingen) was added (0.83 μg/ml) to CFSE-labeled B cells at 72 h after stimulation with LPS, to detect cell death by two-color flow cytometry. To detect CD54, CD86, and MHC class II up-regulation, sorted mutant and control B cells were cultured with LPS (10 μg/ml) in 96-well round-bottom plates as indicated above. After 16 h, cells were washed once with 1 ml of staining buffer, and then stained on ice for 30 min with CD86-PE (GL1), CD54-PE (YN1/1.7.4; eBiosciences), or I-Ab-FITC (AF6-120.1; BD Biosciences). The cells were then washed once in PBS, resuspended in 200 μl of PBS, and analyzed by flow cytometry. B cells were isolated from the spleen and lymph nodes by high-speed sorting, resuspended in complete medium with or without LPS, and seeded (105 cell/well) into 96-well round-bottom plates. At indicated times, live cells were detected as those excluding PI (1 μg/ml) in flow cytometry assays. To detect NF-κB, ERK, JNK, and Akt activation, sorted B cells (2–5 × 106) were stimulated at 37°C in 0.5 ml of RPMI 1640 medium-10% FBS and LPS (10 μg/ml) for the times indicated. Cells were washed once with ice-cold PBS and lysed for 3 min in an ice-cold buffer (1% Triton X-100, 50 mM Tris-HCl (pH 8.0), 150 mM NaCl, 20 mM EDTA, 1 mM Na3VO4, 1 mM NaF, 0.1% SDS, 1 mM EDTA, 1 mM PMSF, 0.7 μg/ml pepstatin, and complete protease inhibitor mixture). Total proteins (10–25 μg) were denatured by boiling for 3 min in SDS-containing sample buffer, separated by 10% SDS/PAGE, and blotted onto nitrocellulose membranes. Blots were incubated with 5% BSA-TBST (20 mM Tris-HCl (pH 7.6), 137 mM NaCl, 0.1% Tween 20) for 1 h at room temperature, and then overnight at 4°C with Abs specific for IκB, ERK1/2, or phosphorylated forms of ERK1/2, Akt (clone 193H12), and JNK (Cell Signaling Technology) at 1/1000 dilution per manufacturer’s recommendation. After three washes, membranes were incubated with HRP-conjugated goat anti-rabbit Igs (Pierce) at 1/2000 dilution in 5% BSA in TBST for 1 h at room temperature. The Western Lighting Chemiluminescence Reagent Plus (PerkinElmer) was used for signal detection with x-ray films (Kodak). Anti-TLR3 Abs were obtained from Santa Cruz Biotechnology. Inactivation of the mouse FADD gene upon deletion of the promoter region and the first coding exon (middle, Fig. 1⇓A) results in homozygous FADD knockout (FADD−/−) mice that die during midgestation (22). We recently showed that a FADD:GFP fusion gene reconstituted normal embryonic and lymphocyte development in FADD−/− mice lacking the endogenous FADD (26). FADD:GFPflox contains two loxP sites flanking the coding region (bottom, Fig. 1⇓A) and can be deleted specifically in T cells using the Lck-Cre transgene (26). To induce deletion of FADD:GFP specifically in the B lineage, we used CD19-Cre mice in which the Cre recombinase gene is expressed in B cells by using the CD19 promoter (middle, Fig. 1⇓A) (48). The CD19 and FADD genes are closely linked, being ∼10 centimorgan apart on the mouse chromosome 7 (top, Fig. 1⇓A). Therefore, it was necessary to cross the CD19-Cre allele onto the mouse chromatid containing the FADD knockout allele (middle, Fig. 1⇓A), to delete FADD:GFP in FADD−/− mice. For this purpose, CD19-Cre mice were first crossed with viable heterozygous FADD+/− mice, and the resulting FADD+/−CD19-Cre mice were backcrossed with C57BL/6 (B6) mice. Cosegregation of the CD19-Cre and FADD knockout alleles in the offspring would indicate that these two genes are linked on the same chromatid in the parental FADD+/− CD19-Cre mice due to homologous recombination. The expected 10% of the mice typed were of such a genotype and subsequently crossed with FADD−/−FADD:GFPflox mice to generate FADD−/−FADD:GFPflox CD19-Cre mice. A, Diagrammatic scheme in generating B cell-specific FADD−/− mice. The CD19 locus is closely linked to FADD on mouse chromosome 7 with a ∼10 centimorgan distance (top). The CD19-Cre allele (48 ) was crossed to the FADD knockout allele (22 ) (middle) by mouse mating to delete FADD:GFPflox specifically in B cells in FADD−/− mice. The promoter of CD19 (arrows), the neomycin-resistant gene (neo), exons of FADD (boxes) and GFP are indicated. Drawings are not to scale. B, Flow cytometric analysis of FADD:GFP deletion in B cells. Single-cell suspensions were prepared from the bone marrow, spleen, lymph nodes, and peripheral blood, and stained for CD19. The indicated percentages of GFP− cells in the CD19+ population of FADD−/− FADD:GFPflox CD19-Cre mice were determined by flow cytometry. Cells from FADD+/−CD19-Cre and FADD−/−FADD:GFPflox mice were used as GFP− and GFP+ controls, respectively. Histograms are from one experiment using one mouse of each genotype, and are representative of 14 independent experiments. C, Total thymocytes and splenocytes (left) or sorted GFP− B cells (right) from FADD−/−FADD:GFPfloxCD19-Cre mice were analyzed by Western blotting using anti-FADD Abs. FADD+/−, FADD+/−FADD:GFPflox, FADD−/−FADD:GFPflox, FADD+/−FADD:GFPfloxCD19-Cre mice were used as controls. The absence of FADD:GFP in GFP− cells were confirmed in three independent experiments. To detect the deletion of FADD:GFP in B cells, FADD−/−FADD:GFPfloxCD19-Cre mice were analyzed by flow cytometry for the presence of GFP-negative (GFP−) cells in the CD19+ population from the bone marrow, spleen, lymph nodes, and peripheral blood. FADD+/− CD19-Cre mice were used as GFP− controls. In GFP-positive (GFP+) control FADD−/− FADD:GFPflox mice which did not contain CD19-Cre, CD19+ B cells uniformly expressed the FADD:GFP fusion protein, as indicated by a distinct GFP+ peak in flow cytometric histograms (Fig. 1⇑B). In FADD−/−FADD:GFPflox CD19-Cre mice, GFP−CD19+ B cells were detectable in the bone marrow (58%), spleen (74%), lymph nodes (76%), and blood (82%; Fig. 1⇑B). The gradually decreasing GFP+ and GFPlow B cell populations indicate continuing FADD:GFP gene deletion and FADD:GFP protein turnover during B cell development and maturation. Western blot analyses of total cells from the spleen revealed reduced levels of the FADD:GFP fusion protein in FADD−/−FADD:GFPfloxCD19-Cre mice, in comparison to control mice lacking CD19-Cre (lanes 3 and 4 on the left, Fig. 1⇑C). As expected, the FADD:GFP protein was not reduced in thymocytes of FADD−/−FADD:GFPfloxCD19-Cre mice (lane 8 on the left, Fig. 1⇑C). Western blot analyses of GFP− B cells purified by high-speed sorting indicated undetectable levels of FADD:GFP (lane 3 on the right, Fig. 1⇑C), in comparison to control GFP− and GFP+ B cells isolated from FADD+/− CD19-Cre and FADD−/−FADD:GFPflox mice, respectively. Therefore, FADD−/−FADD:GFPfloxCD19-Cre mice contain FADD−/− B cells and are referred to as B cell-specific FADD-deficient (or FADD−/−) mice hereafter. FADD+/−FADD:GFPfloxCD19-Cre (FADD+/−) mice containing one allele of the endogenous FADD and CD19 genes were used as controls in the described analyses to follow. Cre gene expression is presumably initiated as early as in the pro-B cell stage, because it is integrated into a site immediately downstream of the CD19 gene promoter (48). To determine the deletion of FADD:GFP in various B cell subsets, total bone marrow cells were isolated from B cell-specific FADD−/− mice, stained for the B lineage-specific marker CD19 and stage-specific markers (c-Kit, CD25, IgM, and IgD), and analyzed by flow cytometry. Few GFP− cells (5.4%) were detected in the pro-B population (CD19+c-Kit+) (Fig. 2⇓A). The percentages of GFP− cells were increasingly higher in the CD19+CD25+ pre-B (56.1%), IgM+IgD− immature (59%), and IgM+IgD+ mature (78.5%) populations, accompanied by a gradual decrease of GFP+ and GFPlow cell numbers in each (Fig. 2⇓A). To analyze the effect of FADD deficiency on B cell development, the bone marrow B cell profile was determined by flow cytometry. When analyzed using stage-specific markers, B cell-specific FADD−/− mice were found to contain pro-B (CD19+c-Kit+), pre-B (CD19+CD25+), immature (IgM+IgD−), and transitional (CD19+AA4.1+) B cells at levels similar to those in the bone marrow in FADD+/− mice (Fig. 2⇓B). There appeared to be lower percentages of recirculating IgD+IgM+ mature B cells in the bone marrow of B cell-specific FADD−/− mice than that in FADD+/− control mice (Fig. 2⇓B). Therefore, B cell development in the bone marrow was not significantly affected in B cell-specific FADD−/− mice. Flow cytometric analyses of the B cell development in the bone marrow in the absence of FADD. A, Deletion of FADD:GFP in the B lineage in the bone marrow of FADD−/− FADD:GFPflox CD19-Cre mice was detected by the presence of the indicated percentages of GFP− B cells at various developmental stages. FADD+/− CD19-Cre mice were used as GFP− controls (dotted histograms). Histograms are from one pair of mice, representative of 14 independent experiments. B, Pro-B (CD19+c-Kit+), pre-B (CD19+CD25+), immature (IgD−IgM+), transitional (CD19+AA4.1+), and recirculating follicular (IgD+IgM+) B cells in the bone marrow of FADD−/−FADD:GFPfloxCD19-Cre (FADD−/−) mice were detected by flow cytometry upon staining with the indicated stage-specific markers. Cells from FADD+/−FADD:GFPfloxCD19-Cre mice (FADD+/−) were used as controls. Data shown are representative of 10 pairs of mice (age 2–6 mo) analyzed. As discussed above (Fig. 1⇑B), B cell-specific FADD−/− mice contained a large proportion (70–80%) of FADD−/− (GFP−) B cells in the peripheral lymphoid organs. The spleen and lymph nodes of B cell-specific FADD−/− mice were generally larger in size (data not shown), and the total cellularity in these organs was significantly higher in mutant mice when compared to control FADD+/− mice (left, Fig. 3⇓A). When analyzed by flow cytometry after staining for CD19 and the T cell marker CD3, B cell-specific FADD−/− mice were found to contain slightly higher percentages of splenic and lymph node B cells than that in FADD+/− mice (Fig. 3⇓B). When total B cell numbers were compared, there was a significant increase of B cells in the spleen and lymph nodes of FADD−/− mice than in these peripheral lymphoid organs of FADD+/− mice (right, Fig. 3⇓A). Peripheral T cell numbers in B cell-specific FADD−/− mice appeared to be higher in comparison to FADD+/− mice (data not shown). However, this phenotype does not appear to be statistically significant. Because of these phenotypes, B220 and CD4 immunohistochemistry was performed on sections of the spleen and lymph nodes isolated from mutant and control mice to examine the microarchitecture of these peripheral lymphoid organs. The B cell follicles in mutant mice were generally larger, particularly in lymph nodes, than in control mice (blue B220, Fig. 3⇓C), which is consistent with the data showing the increased number of B cells in these mutant peripheral lymphoid organs (Fig. 3⇓, A and B). However, the T cell compartment appears to be unaffected by a lack of FADD in B cells (brown-CD4, Fig. 3⇓C). Analysis of the peripheral lymphoid system in B cell-specific FADD−/− mice. A, Total (left) and CD19+ B (right) cell numbers in the spleen and lymph nodes from FADD−/−FADD:GFPfloxCD19-Cre mice (FADD−/−) were compared with that of control FADD+/−FADD:GFPfloxCD19-Cre mice (FADD+/−). Error bars indicate SD from analysis of seven mice of each indicated genotype. B, Representative dot plots from flow cytometric analyses of CD3+ T cells and CD19+ B cells in 15 mice of each genotype indicated. C, Immunohistological analysis of cryosections of the spleen and lymph nodes. B cells were stained with anti-B220 Abs (blue) and T cells were stained with anti-CD4 Abs (brown). Data shown are representative of analysis of five mice of each indicated genotype. To analyze B cell development in the periphery, splenocytes were isolated and analyzed by flow cytometry. The T1 (IgDlowIgMhigh) and T2 (IgDhighIgMhigh) transitional B cells were present in B cell-specific FADD−/− mice in percentages similar to that in FADD+/− mice (see Fig. 4⇓A). The percentages of marginal zone and follicular B cells in the mutant spleen were also similar to that in control mice, as determined by staining for IgD and IgM, or CD21 and CD23 (see Fig. 4⇓, A and B). These results indicate that the FADD deficiency did not affect B cell development in the periphery. Because the percentages of transitional, marginal zone, and follicular B cells in the periphery of B cell-specific FADD−/− mice are similar to those of FADD+/− mice (see Fig. 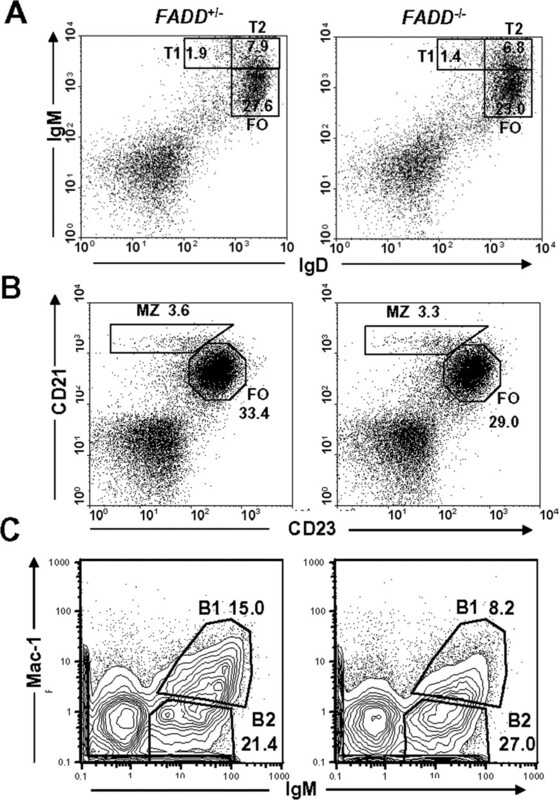 4⇓, A and B), the higher total B cell numbers as seen in the spleen in FADD−/− mice (Fig. 3⇑A) is likely due to increases in every B cell subpopulation, and not because of selective expansion of a particular B cell population. To analyze the effect of FADD deficiency on the B1 cell population, peritoneal cells were isolated from mutant and control mice and analyzed by flow cytometry. As shown in Fig. 4⇓C, the percentage of IgM+Mac1+ B1 cells in B cell-specific FADD−/− mice (9.55 ± 3.84%; n = 10) was ∼60% of that in control FADD+/− mice (16.46 ± 3.61%; n = 10). Flow cytometric analysis of B cell development in the spleen and peritoneal cavity in the B cell-specific FADD−/− mice. FADD+/−FADD:GFPfloxCD19-Cre mice (FADD+/−) were used as controls. Spleen cells were stained for IgD and IgM (A), or for CD21 and CD23 (B), and peritoneal cells were stained for IgM and Mac-1 (C). Percentages of splenic transitional (T1 and T2), follicular (FO), marginal zone (MZ), and peritoneal B cells are indicated. Flow cytometric plots are representative of analysis of five mice of each indicated genotype. FADD is critical for Fas-induced apoptosis in fibroblasts and T cells (16, 26). To determine Fas-induced cell death responses, B cells were sorted from the spleen and lymph nodes and cultured in the presence of FLAG-tagged sFasL, which was then cross-linked by using anti-FLAG Abs. 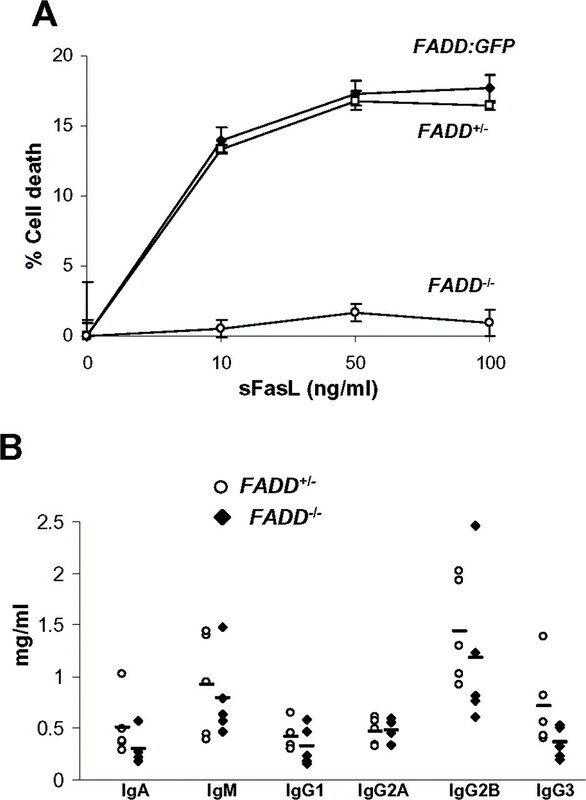 Both FADD+/− B cells and those lacking the endogenous FADD but expressing FADD:GFP isolated from FADD−/− FADD:GFPflox mice were killed in a dose-dependent manner by this treatment (Fig. 5⇓A), indicating that FADD:GFP functions similarly to the endogenous FADD. In contrast, FADD−/− B cells were resistant to cell death induced by sFasL at various concentrations (Fig. 5⇓A). Defective Fas signaling may lead to autoimmune diseases such as arthritis, higher levels of serum Igs, and increased mortality in aged mice. Although B cell-specific FADD−/− mice contained increased numbers of B cells defective in Fas-induced apoptosis, they showed no obvious joint swelling, a symptom of arthritis, and had survival rates similar to that of control littermates even when aged. We also collected sera of mice aged 2–10 mo and assayed for Ig levels. The data in Fig. 5⇓B indicate that B cell-specific FADD−/− mice aged from 2 to 10 mo contained lower average serum Ig levels in comparison with those in FADD+/− control mice. Therefore, FADD is essential for B cell apoptosis induced by Fas-induced signaling, yet a lack of FADD in B cells is not sufficient for induction of autoimmune diseases in mice. Apoptosis and serum Ig analyses. 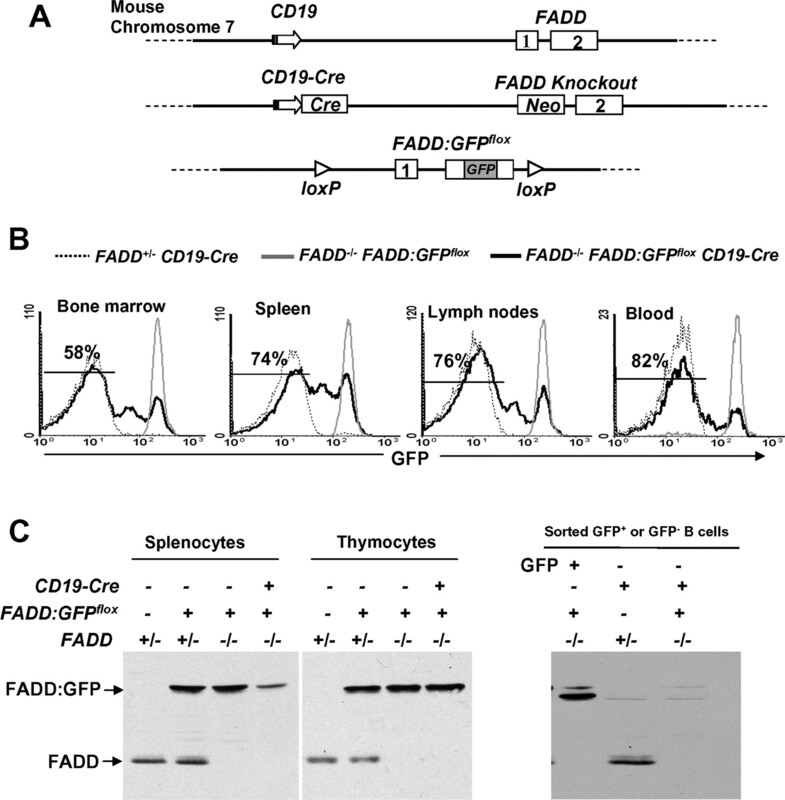 A, FADD:GFP, FADD+/−, and FADD−/− B cells were sorted from FADD−/−FADD:GFPflox, FADD+/−FADD:GFPfloxCD19-Cre, and FADD−/−FADD:GFPfloxCD19-Cre mice, respectively. Apoptosis in these cells was induced by stimulation with sFasL for 16 h, and measured by PI staining and flow cytometry. Error bars indicate SD of triplicates from one experiment, and is representative of seven independent experiments using mice of different ages. B, Sera were collected from five mice of the FADD+/−FADD:GFPfloxCD19-Cre (○) and FADD−/−FADD:GFPfloxCD19-Cre (♦) genotypes, aged from 2 to 10 mo. Ig levels were determined by ELISA. Bars indicate mean values for each Ig assay. T cell-specific deficiency of FADD resulted in not only defective Fas-induced apoptosis, but also abnormal TCR-induced proliferation responses (26). We therefore examined FADD−/− B cell proliferation in response to various stimuli. Signaling through the BCR can be induced by treatment with F(ab′)2 anti-IgM Abs. FADD+/− and FADD−/− B cells were isolated by sorting for the GFP− population from the spleen and lymph nodes, and treated with increasing concentrations of anti-IgM Abs. As shown in Fig. 6⇓A, no significant difference between control and mutant B cells was detected in [3H]thymidine-labeling assays. Stimulation of CD40 using anti-CD40 Abs can also induce proliferation responses in B cells, which was unaffected by the absence of FADD (Fig. 6⇓B). B cells have certain functions related to innate immunity, such as TLR expression and proliferative responses induced by various pathogen-associated macromolecules, which are natural ligands for TLRs. For example, LPS produced by Gram-negative bacteria, dsRNA, and CpG-containing DNA of the viral origin can stimulate TLR4, 3, and 9, respectively. To analyze TLR-mediated responses, FADD+/− and FADD−/− B cells were sorted from the spleen and lymph nodes of mutant and control mice and stimulated with increasing concentrations of poly(I:C), LPS, or CpG-containing DNA. As shown in Fig. 6⇓, C and D, the absence of FADD dramatically reduced B cell proliferation in response to poly(I:C), or LPS. In contrast, FADD−/− B cells proliferated as efficiently as FADD+/− B cells when stimulated with CpG-containing oligo DNA (Fig. 6⇓E). Control oligo DNA only induced background responses in both mutant and control B cells (Fig. 6⇓F). A FADD deficiency did not result in any obvious defects in the expression of TLR3 and TLR4 in B cells as determined by Western blot and flow cytometric analyses (Fig. 6⇓, G and H). These results indicate that FADD plays a negligible role in proliferative responses induced by BCR, CD40, and TLR9, but is essential for those induced by TLR3 and TLR4. Analysis of B cell proliferation. 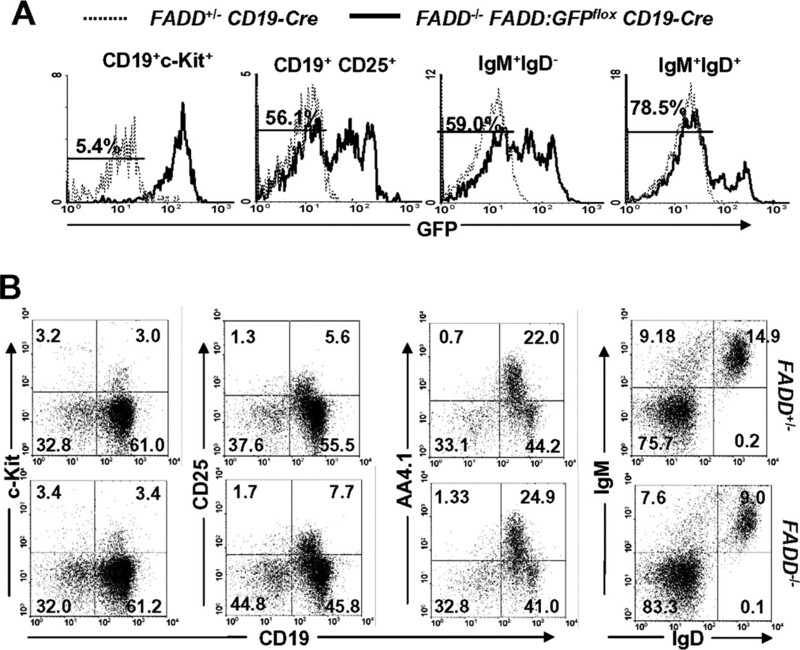 FADD+/− (▪) and FADD−/− B cells (□) were sorted for the GFP− population from FADD+/−FADD:GFPfloxCD19-Cre and FADD−/−FADD:GFPfloxCD19-Cre mice, and stimulated in triplicates with anti-IgM Abs (A), anti-CD40 Abs (B), poly(I:C) (C), LPS (D), CpG-containing DNA (E), or nonspecific, control oligo DNA (F) at the concentrations indicated. Proliferation was indicated by the amount of [3H]thymidine incorporated (shown as cpm on y-axis). Error bars indicate SD of triplicates. Data shown are from one experiment and represent three to five independent experiments. G, Expression of TLR3 expression was determined by Western blotting. H, Expression of TLR4 was determined by flow cytometry. To further analyze the proliferation defects in FADD−/− B cells, cell division kinetics were determined using CFSE to label intracellular molecules, as CFSE fluorescence intensity halves upon each cell division. FADD+/− and FADD−/− B cells were sorted from the spleen and lymph nodes, labeled with CFSE, and stimulated with LPS or anti-IgM ABS to induce proliferation. As shown in Fig. 7⇓A (top), cell division potentials in FADD+/− and FADD−/− B cells were equivalent in response to BCR stimulation with anti-IgM Abs, a result in agreement with [3H]thymidine-labeling assays (Fig. 6⇑A). However, FADD−/− B cells had a profound defect in cell division in comparison with control FADD+/− B cells in cultures stimulated with LPS for 72, 96, and 120 h (bottom, Fig. 7⇓A). To analyze any intrinsic defects in survival due to FADD deletion, B cells were cultured in complete medium without any stimulation and cell survival was determined by PI exclusion and flow cytometry. No consistent difference between FADD−/− and FADD+/− B cells in survival capability was detected over a period of 2 days in culture in several independent experiments (Fig. 7⇓B). We further analyzed B cell death during stimulation with LPS by PI uptake and flow cytometry. Similar cell death rates were detected in both mutant and control B cells during an initial 12-h stimulation (Fig. 7⇓B). 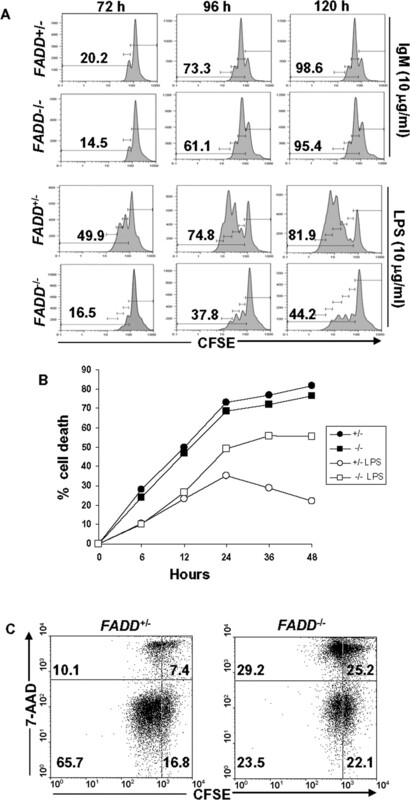 In the FADD+/− B cell culture stimulated with LPS, cell death peaked at 24 h and gradually decreased thereafter, whereas higher percentages of cell death were detected in FADD−/− B cells at these time points during the 2-day stimulation (Fig. 7⇓B). In a different assay, we performed two-color flow cytometric analyses by staining the CFSE-labeled B cell with 7-AAD. Cell death in the B cell cultures were indicated by 7-AAD-positive populations. As shown in Fig. 7⇓C, there was more cell death in FADD−/− than in FADD+/− B cell cultures stimulated by LPS. These results indicate that FADD−/− B cells do not appear to have intrinsic defects in ex vivo survival, but are not capable of complete division induced by LPS stimulation, thus resulting in increased cell death. Cell division, survival, and death analyses. A, Purified FADD+/− and FADD−/− splenic and lymph node B cells were labeled with CFSE, and stimulated with anti-IgM Abs (10 μg/ml; top) or LPS (10 μg/ml; bottom), and division of B cells was determined by flow cytometry at 72, 96, and 120 h poststimulation. Percentages of divided cells were indicated. B, To determine survival capability, sorted FADD−/− and FADD+/− control B cells were cultured in complete medium for 2 days, and at indicated times cells were analyzed by flow cytometry for viability as indicated by PI exclusion. Cell death in mutant and control B cells stimulated with LPS (1 μg/ml) were determined similarly by flow cytometry. C, Cell death and division were analyzed by two-color flow cytometry by 7-AAD staining of CFSE-labeled B cells stimulated with LPS for 72 h. Data shown are from one experiment using one pair of mice, and are representative of three independent experiments. In normal B cells, LPS induces expression of CD54 (ICAM-1), the costimulatory receptor ligand B7.2 (CD86), and MHC class II molecules. The expression of these activation markers was analyzed by flow cytometry. Freshly isolated FADD−/− B cells from the spleen and lymph nodes express basal levels of CD54 and CD86 on their surface, similar to that on FADD+/− B cells (Fig. 8⇓A). Within 16 h after stimulation by LPS, these two proteins were up-regulated equivalently in both mutant and control B cells (Fig. 8⇓A). Resting B cells acting as professional APCs expressed high levels of MHC class II, which was further up-regulated during stimulation by LPS for 16 h in both FADD+/− and FADD−/− B cells (Fig. 8A). Therefore, a FADD deficiency did not appear to affect expression of activation markers induced by LPS stimulation. Analysis of activation marker up-regulation and intracellular signaling in B cells. A, Induction of CD54, CD86, and MHC class II was analyzed by staining with indicated Abs at 0 (thin lines) and 16 h (thick lines) after LPS stimulation of sorted FADD−/− mutant and FADD+/− control B cells. B, Total proteins from FADD+/− and FADD−/− B cells stimulated with LPS (10 μg/ml) for the indicated times were analyzed for NF-κB activation by detecting degradation of IκB. To analyze ERK activation, the same nitrocellulose membrane was reprobed with Abs specific for phosphorylated (p)-ERK1/2, and probed with anti-ERK1/2 Abs after stripping. The membrane was probed for the fourth time with anti-p-JNK Abs after the second stripping. A separate membrane with samples collected at the indicated times was probed with anti-p-Akt Abs to detect Akt phosphorylation induced by LPS stimulation (10 μg/ml). FADD+/− B cells were used as control. Data shown are representative of at least three independent experiments. Stimulation of TLRs induces activation of NF-κB and MAPKs such as ERKs and JNK (42). Upon signaling, the inhibitory subunit of NF-κB, IκB, is targeted for ubiquitination and degradation by the proteosome, thus releasing NF-κB for translocation to the nucleus (49). To analyze NF-κB activation, Western blotting was used to detect IκB. As demonstrated in Fig. 8⇑B, the IκB protein was present in unstimulated B cells (0 min) and was reduced at later time points (15, 30, 45 min), indicating degradation of IκB was initiated in both FADD+/− and FADD−/− B cells upon stimulation with LPS. Phosphorylation of IκB, as determined by Western blot analyses using phospho-IκB-specific Abs, was not affected in FADD−/− B cells stimulated with LPS (data not shown). To analyze activation of MAPKs, Western blotting was used to detect phosphorylation of ERK1/2. In FADD+/− B cells, activation of ERK1/2 was evident, as indicated by the presence of the phosphorylated ERK1/2 within 15 min following LPS stimulation (Fig. 8⇑B). Similar ERK1/2 activation kinetics were observed in FADD−/− B cells. Activation of JNK was also analyzed by Western blotting using phosphospecific Abs, and no apparent difference between FADD+/− and FADD−/− B cells stimulated by LPS was detected (Fig. 8⇑B). PI3K can be activated by LPS, leading to the activation of the oncogenic serine/threonine kinase Akt, also known as protein kinase B (50, 51). As shown in Fig. 8⇑B, Akt activation was readily achieved by LPS stimulation in both FADD+/− and FADD−/− B cells, as indicated by phosphorylation of Akt. The FADD protein was initially identified as an adaptor molecule required for cell death signaling induced by DD-containing receptors such as Fas, TNFR1, and TRAILR. These death receptors play an important role in regulating the function of the immune system and possibly in tumor surveillance, but are dispensable during embryonic development and hemopoiesis. FADD has additional functions because its absence in germ cells results in early embryonic lethality. In this study, we analyzed the function of FADD in the B cell lineage using a conditional FADD mutant mouse model, and demonstrated that the deletion of FADD specifically in B cells at the pre-B stage had no major effect on B cell development (Figs. 2⇑ and 3⇑). A FADD deficiency inhibited Fas-induced apoptosis (Fig. 5⇑), resulting in an increased number of splenic and lymph node B cells (Fig. 3⇑). Interestingly, peritoneal B1 cells were reduced in these B cell-specific FADD-deficient mice (Fig. 4⇑). Unlike FADD−/− T cells which are defective in Ag receptor-induced proliferation responses (26), FADD−/− B cells appear to proliferate normally in response to stimulation of the BCR (Fig. 6⇑). In addition, proliferation of B cells induced by CD40 or TLR9 stimulation was not affected in the absence of FADD. Surprisingly, however, FADD−/− B cells have a profound defect in proliferation induced by stimulation of TLR3 and TLR4. These results have thus revealed a novel function of FADD in the innate immune responses mediated by TLRs. During the early stages of B lymphocyte development in the bone marrow, lymphoid progenitor cells give rise to fully committed B lymphocytes after a process of sequential recombination and assembly of Ig gene segments. In a previous study using viable mutant chimeras generated using FADD−/− ES cells and Rag-1−/− blastocytes, FADD was absent through embryonic and lymphoid development (22). These chimeras contained few T cells and undetectable levels of B cells in the periphery. In this study, an absence of FADD at the pre-B and subsequent stages still allowed the generation of immature and mature B cells in the bone marrow and periphery at levels similar to FADD-expressing control mice (Figs. 2–4⇑⇑⇑). Therefore, it is likely that FADD plays a more important role in earlier progenitor cells before development reaches the pre-B and later stages. B1 cells represent a unique population of B lymphocytes and can be distinguished from other B cells by their surface phenotype (39, 40). They constitute a substantial fraction of B cells in the peritoneal cavity and express Mac-1 (CD11b/CD18 or complement receptor type 3). The B1 lineage is presumably derived from precursors in the fetal liver and would persist for the life of the animal by self-renewal in adults. Mutations in several genes in mice such as CD19, B cell linker protein, Bruton’s tyrosine kinase, Vav, phospholipase Cγ2, the PI3K p85 subunit, and protein kinase C result in reduced B-1 cells (40). In this study, B cell-specific FADD−/− mice also contained reduced numbers of B1 cells, indicating that FADD may play a role in the development of B1 B cells. It is interesting that similar to FADD, caspase 8 and the caspase 8-like regulatory protein c-FLIP are also essential for embryonic development (24, 25). T cell-specific caspase 8−/− mice have no major defect in thymocyte development, but contain reduced numbers of peripheral T cells (30). B cell-specific caspase 8−/− mice have no major defect in bone marrow B cell development, but contain increased number of peripheral conventional B cells and reduced B1 B cells (52). These phenotypes are strikingly similar to those of lymphocyte-specific FADD−/− mice as described in previous studies and this study (26). In the analysis of c-FLIP function, deletion of the c-FLIP gene in ES cells or lymphocytes resulted in phenotypes similar to those of FADD gene deletion in ES cells or lymphocytes. Whereas c-FLIP−/−→Rag-1−/− chimeras generated from c-FLIP−/− ES cells have severe defects in T and B cell development (33), T cell-specific deletion of c-FLIP has no obvious effect on thymocyte development, but inhibits peripheral T cell production (32). Additional Cre systems could be used in future studies to help determine the temporal requirement of FADD, caspase 8, and c-FLIP during development of lymphoid progenitors. The phenotype of increased B cells in the spleen and lymph nodes of B cell-specific FADD−/− mice is distinct from that of T cell-specific FADD−/− mice, which contain a reduced peripheral T cell pool (26). This phenotypic difference may be due to the differential roles of FADD in these two distinct cell lineages. Whereas FADD is essential for Ag receptor signaling in T cells, it is dispensable in BCR signaling (Fig. 6⇑). Defective TCR signaling resulted in a reduced capacity for homeostatic expansion, a possible cause for T lymphopenia in T cell-specific FADD−/− mice (26). The increased peripheral B cell numbers in B cell-specific FADD−/− mice may be due in part to defective Fas-induced apoptosis (Fig. 5⇑), which also regulates B cell homeostasis. Unexpectedly, a FADD deficiency in B cells did not appear to result in an elevated serum Ig concentration or ALPS, even in aged mice (Fig. 5⇑), unlike that caused by the Fas deficiency in mice. This phenotype may not be surprising, given the results from a recent study showing that a B cell-specific Fas deficiency did not result in autoimmune diseases in mice (53). However, an lpr-like disease becomes obvious when Fas is deleted simultaneously in both lymphoid and nonlymphoid cells. Therefore, a lack of FADD in B cells along with other cell types may result in autoimmune pathology. It would be of interest to determine whether this is the case when additional Cre systems are used to delete FADD in multiple cell types in adult mice. The “pattern recognition” receptors, TLRs, play important roles in innate immune responses against various microbial pathogens (42, 54). TLRs recruit the shared cytoplasmic adaptor protein MyD88 via TIR-TIR interaction, leading to the activation of IL-1R-associated kinases. Later studies revealed a MyD88-independent pathway mediated by another TIR-containing adaptor, TRIF, particularly in TLR3 and TLR4 signaling (46). In this study, we showed that FADD deficiency abrogated proliferation of B cells stimulated by either dsRNA or LPS, but not by CpG-containing DNA, thus introducing FADD as a new component of TLR3- and TLR4-induced signaling pathways. Interestingly, the recently reported B cell-specific caspase 8-deficient mice also have a defect in B cell proliferative responses induced by TLR3 and TLR4 (52). TLRs are capable of inducing signal transduction pathways involving NF-κB and MAPKs such as ERK and JNK. Inactivation of MyD88 still allows for the activation of these pathways in response to LPS, albeit with delayed kinetics (55). Disruption of TRIF has no obvious effect on the activation of MAPKs and NF-κB induced by LPS, but inhibits up-regulation of CD54, CD86, and MHC class II molecules (46, 56). However, deletion of both MyD88 and TRIF completely inhibited LPS-induced activation of NF-κB and MAPKs (46). Previous reports suggested that FADD was able to activate the NF-κB and MAPK pathways (57, 58). Another early signal required for survival during B cell proliferation is the activation of PI3K (50, 51). Stimulation of TLR4 by LPS can activate PI3K in B cells, leading to the activation of the serine/threonine kinase Akt. A recent study has shown that the receptor interacting kinase protein RIP plays a role in TLR4 signal-induced activation of Akt in B cells (59). In this study, LPS- and dsRNA-induced proliferative responses were defective in FADD−/− B cells in [3H]thymidine incorporation and cell division kinetics assays (Figs. 6⇑ and 7⇑). However, LPS-induced activation of NF-κB and MAPKs appeared to be unaffected in FADD−/− B cells (Fig. 8⇑B). Furthermore, Akt activation in FADD−/− B cells appeared to be normal following LPS stimulation (Fig. 8⇑B). LPS-induced up-regulation of MHC class II proteins as well as of the activation markers CD54 and CD86, which are dependent on the TRIF pathway (46, 56), were not affected by a lack of FADD in B cells (Fig. 8⇑B). In the recently reported B cell-specific caspase 8-deficient mice, B cells did not appear to have defects in activation marker up-regulation or the activation of NF-κB and MAPKs (52). Therefore, it is likely that FADD and caspase 8 mediate additional pathways induced by TLR3 or TLR4 signaling. We thank Dr. Bice Perussia for critical reading of the manuscript; Drs. Arthur Buchberg, Fritz Melchers, and Kishore Alugupalli for discussion; Dr. Klaus Rajewsky for providing CD19-Cre mice; Dr. R. C. Rickert for providing the protocol for PCR typing of CD19-Cre mice; and Xiaohe Liu for technical help. ↵1 This work was supported in part by National Institutes of Health Grant CA95454, a W. W. Smith Charitable Trust grant, and a CONCERN Foundation grant (to J.Z.). S.R. is supported by National Research Service Award Training Grant T32-AI07492. ↵2 H.Z.I., S.R., and Y.Z. contributed equally. ↵4 Abbreviations used in this paper: ALPS, autoimmune-lymphoproliferative syndrome; DD, death domain; FADD, Fas-associated DD protein; DED, death effector domain; c-FLIP, cellular FLICE-like inhibitory protein; TIR, TLR/IL-1R; TRIF, TIR domain-containing adaptor protein-inducing IFN-β; sFasL, soluble FasL; PI, propidium iodide; 7-AAD, 7-aminoactinomycin D; ES, embryonic stem. Strasser, A., P. Bouillet. 2003. The control of apoptosis in lymphocyte selection. Immunol. Rev. 193: 82-92. Lenardo, M., K. M. Chan, F. Hornung, H. McFarland, R. Siegel, J. Wang, L. Zheng. 1999. Mature T lymphocyte apoptosis–immune regulation in a dynamic and unpredictable antigenic environment. Annu. Rev. Immunol. 17: 221-253. Rathmell, J. C., C. B. Thompson. 2002. Pathways of apoptosis in lymphocyte development, homeostasis, and disease. Cell 109: (Suppl.):S97-S107. Hildeman, D. A., Y. Zhu, T. C. Mitchell, J. Kappler, P. Marrack. 2002. Molecular mechanisms of activated T cell death in vivo. Curr. Opin. Immunol. 14: 354-359. Cohen, P. L., R. A. Eisenberg. 1991. lpr and gld: single gene models of systemic autoimmunity and lymphoproliferative disease. Annu. Rev. Immunol. 9: 243-269. Nagata, S., P. Golstein. 1995. The Fas death factor. Science 267: 1449-1455. Fisher, G. H., F. J. Rosenberg, S. E. Straus, J. K. Dale, L. A. Middleton, A. Y. Lin, W. Strober, M. J. Lenardo, J. M. Puck. 1995. Dominant interfering Fas gene mutations impair apoptosis in a human autoimmune lymphoproliferative syndrome. Cell 81: 935-946. Zhang, J., A. Winoto. 1996. A mouse Fas-associated protein with homology to the human Mort1/FADD protein is essential for Fas-induced apoptosis. Mol. Cell. Biol. 16: 2756-2763. Boldin, M. P., E. E. Varfolomeev, Z. Pancer, I. L. Mett, J. H. Camonis, D. Wallach. 1995. A novel protein that interacts with the death domain of Fas/APO1 contains a sequence motif related to the death domain. J. Biol. Chem. 270: 7795-7798. Chinnaiyan, A. M., K. O’Rourke, M. Tewari, V. M. Dixit. 1995. FADD, a novel death domain-containing protein, interacts with the death domain of Fas and initiates apoptosis. Cell 81: 505-512. Muzio, M., A. M. Chinnaiyan, F. C. Kischkel, K. O’Rourke, A. Shevchenko, J. Ni, C. Scaffidi, J. D. Bretz, M. Zhang, R. Gentz, et al 1996. FLICE, a novel FADD-homologous ICE/CED-3-like protease, is recruited to the CD95 (Fas/APO-1) death-inducing signaling complex. Cell 85: 817-827. Boldin, M. P., T. M. Goncharov, Y. V. Goltsev, D. Wallach. 1996. Involvement of MACH, a novel MORT1/FADD-interacting protease, in Fas/APO-1-and TNF receptor-induced cell death. Cell 85: 803-815. Bodmer, J.-L., N. Holler, S. Reynard, P. Vinciguerra, P. Schneider, P. Juo, J. Blenis, J. Tschopp. 2000. TRAIL receptor-2 signals apoptosis through FADD and caspase 8. Nat. Cell Biol. 2: 241-243. Chinnaiyan, A. M., C. G. Tepper, M. F. Seldin, K. O’Rourke, F. C. Kischkel, S. Hellbardt, P. H. Krammer, M. E. Peter, V. M. Dixit. 1996. FADD/MORT1 is a common mediator of CD95 (Fas/APO-1) and tumor necrosis factor receptor-induced apoptosis. J. Biol. Chem. 271: 4961-4965. Kuang, A. A., G. E. Diehl, J. Zhang, A. Winoto. 2000. FADD is required for DR4- and DR5-mediated apoptosis: lack of TRAIL-induced apoptosis in FADD-deficient mouse embryonic fibroblasts. J. Biol. Chem. 275: 25065-25068. Imtiyaz, H. Z., Y. Zhang, J. Zhang. 2005. 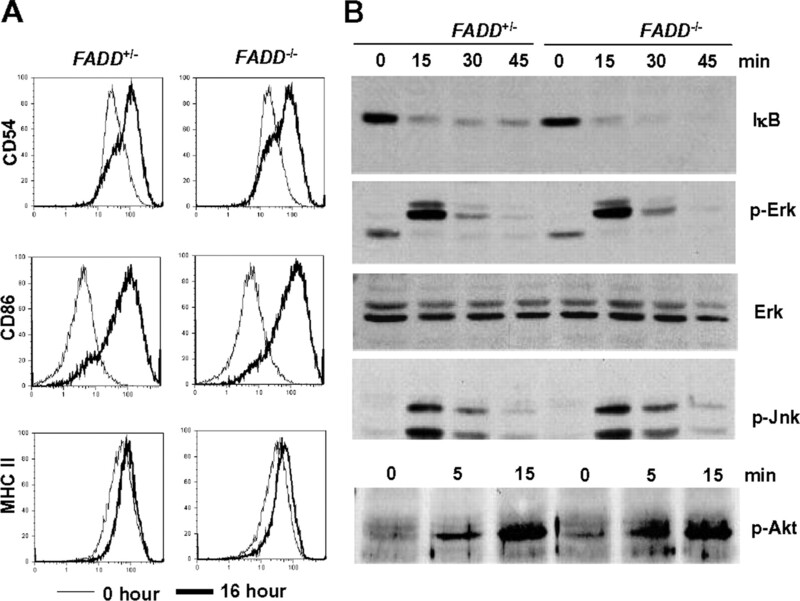 Structural requirements for signal-induced target binding of FADD determined by functional reconstitution of FADD deficiency. J. Biol. Chem. 280: 31360-31367. Irmler, M., M. Thome, M. Hahne, P. Schneider, K. Hofmann, V. Steiner, J.-L. Bodmer, M. Schroter, K. Burns, C. Mattmann, et al 1997. Inhibition of death receptor signals by cellular FLIP. Nature 388: 190-195. Shu, H.-B., D. R. Halpin, D. V. Goeddel. 1997. Casper is a FADD- and caspase-related inducer of apoptosis. Immunity 6: 751-763. Goltsev, Y. V., A. V. Kovalenko, E. Arnold, E. E. Varfolomeev, V. M. Brodianskii, D. Wallach. 1997. CASH, a novel caspase homologue with death effector domains. J. Biol. Chem. 272: 19641-19644. Diehl, G. E., H. H. Yue, K. Hsieh, A. A. Kuang, M. Ho, L. A. Morici, L. L. Lenz, D. Cado, L. W. Riley, A. Winoto. 2004. 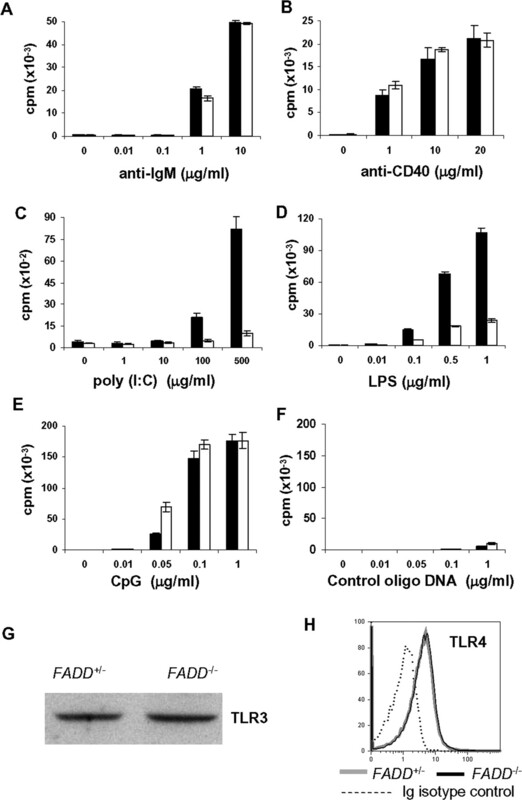 TRAIL-R as a negative regulator of innate immune cell responses. Immunity 21: 877-889. Zhang, J., D. Cado, A. Chen, N. H. Kabra, A. Winoto. 1998. Absence of Fas-mediated apoptosis and T cell receptor-induced proliferation in FADD-deficient mice. Nature 392: 296-300. Yeh, W.-C., J. L. Pompa, M. E. McCurrach, H.-B. Shu, A. J. Elia, A. Shahinian, M. Ng, A. Wakeham, W. Khoo, K. Mitchell, et al 1998. FADD: essential for embryo development and signaling from some, but not all, inducers of apoptosis. Science 279: 1954-1958. Varfolomeev, E. E., M. Schuchmann, V. Luria, N. Chainnilkulchai, S. J. Beckmann, I. Mett, D. Rebrikov, V. M. Brodianski, O. C. Kemper, O. Kollet, et al 1998. Targeted disruption of the mouse caspase 8 gene ablates cell death induction by the TNF receptors, Fas/Apo1, and DR3 and is lethal prenatally. Immunity 9: 267-276. Yeh, W.-C., A. Itie, A. J. Elia, M. Ng, H.-B. Shu, A. Wakeham, C. Mirtsos, N. Suzuki, M. Bonnard, D. V. Goeddel, T. W. Mak. 2000. Requirement for Casper (c-FLIP) in regulation of death receptor-induced apoptosis and embryonic development. Immunity 12: 633-642. Zhang, Y., S. Rosenberg, H. Wang, H. Z. Imtiyaz, Y. J. Hou, J. Zhang. 2005. Conditional Fas-associated death domain protein (FADD):GFP knockout mice reveal FADD is dispensable in thymic development but essential in peripheral T cell homeostasis. J. Immunol. 175: 3033-3044. Newton, K., A. W. Harris, M. L. Bath, K. G. C. Smith, A. Strasser. 1998. A dominant interfering mutant of FADD/MORT1 enhance deletion of autoreactive thymocytes and inhibits proliferation of mature T lymphocytes. EMBO J. 17: 706-718. Walsh, C. M., B. G. Wen, A. M. Chinnaiyan, K. O’Rourke, V. M. Dixit, S. M. Hedrick. 1998. A role for FADD in T cell activation and development. Immunity 8: 439-449. Zornig, M., A.-O. Hueber, G. Evan. 1998. p53-dependent impairment of T-cell proliferation in FADD dominant-negative transgenic mice. Curr. Biol. 8: 467-470. Salmena, L., B. Lemmers, A. Hakem, E. Matysiak-Zablocki, K. Murakami, P. Y. Au, D. M. Berry, L. Tamblyn, A. Shehabeldin, E. Migon, et al 2003. Essential role for caspase 8 in T-cell homeostasis and T-cell-mediated immunity. Genes Dev. 17: 883-895. Kang, T. B., T. Ben-Moshe, E. E. Varfolomeev, Y. Pewzner-Jung, N. Yogev, A. Jurewicz, A. Waisman, O. Brenner, R. Haffner, E. Gustafsson, et al 2004. Caspase-8 serves both apoptotic and nonapoptotic roles. J. Immunol. 173: 2976-2984. Zhang, N., Y. W. He. 2005. An essential role for c-FLIP in the efficient development of mature T lymphocytes. J. Exp. Med. 202: 395-404. Chau, H., V. Wong, N. J. Chen, H. L. Huang, W. J. Lin, C. Mirtsos, A. R. Elford, M. Bonnard, A. Wakeham, A. I. You-Ten, et al 2005. Cellular FLICE-inhibitory protein is required for T cell survival and cycling. J. Exp. Med. 202: 405-413. Chun, H. J., L. Zheng, M. Ahmad, J. Wang, C. K. Speirs, R. M. Siegel, J. K. Dale, J. Puck, J. Davis, C. G. Hall, et al 2002. Pleiotropic defects in lymphocyte activation caused by caspase-8 mutations lead to human immunodeficiency. Nature 419: 395-399. Su, H., N. Bidere, L. Zheng, A. Cubre, K. Sakai, J. Dale, L. Salmena, R. Hakem, S. Straus, M. Lenardo. 2005. Requirement for caspase-8 in NF-κB activation by antigen receptor. Science 307: 1465-1468. Martin, F., J. F. Kearney. 2000. B-cell subsets and the mature preimmune repertoire: marginal zone and B1 B cells as part of a “natural immune memory”. Immunol. Rev. 175: 70-79. Martin, F., J. F. Kearney. 2002. Marginal-zone B cells. Nat. Rev. Immunol. 2: 323-335. Saito, T., S. Chiba, M. Ichikawa, A. Kunisato, T. Asai, K. Shimizu, T. Yamaguchi, G. Yamamoto, S. Seo, K. Kumano, et al 2003. Notch2 is preferentially expressed in mature B cells and indispensable for marginal zone B lineage development. Immunity 18: 675-685. Hardy, R. R., K. Hayakawa. 2001. B cell development pathways. Annu. Rev. Immunol. 19: 595-621. Berland, R., H. H. Wortis. 2002. Origins and functions of B-1 cells with notes on the role of CD5. Annu. Rev. Immunol. 20: 253-300. Martin, F., J. F. Kearney. 2001. B1 cells: similarities and differences with other B cell subsets. Curr. Opin. Immunol. 13: 195-201. Barton, G. M., R. Medzhitov. 2003. Toll-like receptor signaling pathways. Science 300: 1524-1525. Muzio, M., J. Ni, P. Feng, V. M. Dixit. 1997. IRAK (Pelle) family member IRAK-2 and MyD88 as proximal mediators of IL-1 signaling. Science 278: 1612-1615. Yamamoto, M., K. Takeda, S. Akira. 2004. TIR domain-containing adaptors define the specificity of TLR signaling. Mol. Immunol. 40: 861-868. Vora, K. A., J. V. Ravetch, T. Manser. 1997. Amplified follicular immune complex deposition in mice lacking the Fc receptor γ-chain does not alter maturation of the B cell response. J. Immunol. 159: 2116-2124. Rickert, R. C., J. Roes, K. Rajewsky. 1997. B lymphocyte-specific, Cre-mediated mutagenesis in mice. Nucleic Acids Res. 25: 1317-1318. Silverman, N., T. Maniatis. 2001. NF-κB signaling pathways in mammalian and insect innate immunity. Genes Dev. 15: 2321-2342. Venkataraman, C., G. Shankar, G. Sen, S. Bondada. 1999. Bacterial lipopolysaccharide induced B cell activation is mediated via a phosphatidylinositol 3-kinase dependent signaling pathway. Immunol. Lett. 69: 233-238. Fruman, D. A., S. B. Snapper, C. M. Yballe, L. Davidson, J. Y. Yu, F. W. Alt, L. C. Cantley. 1999. Impaired B cell development and proliferation in absence of phosphoinositide 3-kinase p85α. Science 283: 393-397. Beisner, D. R., I. L. Ch’en, R. V. Kolla, A. Hoffmann, S. M. Hedrick. 2005. Cutting edge: innate immunity conferred by B cells is regulated by caspase-8. J. Immunol. 175: 3469-3473. Hao, Z., B. Hampel, H. Yagita, K. Rajewsky. 2004. T cell-specific ablation of Fas leads to Fas ligand-mediated lymphocyte depletion and inflammatory pulmonary fibrosis. J. Exp. Med. 199: 1355-1365. Hoebe, K., E. M. Janssen, S. O. Kim, L. Alexopoulou, R. A. Flavell, J. Han, B. Beutler. 2003. Upregulation of costimulatory molecules induced by lipopolysaccharide and double-stranded RNA occurs by Trif-dependent and Trif-independent pathways. Nat. Immunol. 4: 1223-1229. Hu, W. H., H. Johnson, H. B. Shu. 2000. Activation of NF-κB by FADD, Casper, and caspase-8. J. Biol. Chem. 275: 10838-10844. Vivarelli, M. S., D. McDonald, M. Miller, N. Cusson, M. Kelliher, R. S. Geha. 2004. RIP links TLR4 to Akt and is essential for cell survival in response to LPS stimulation. J. Exp. Med. 200: 399-404.